Have you checked out the new DOMOTEX HotelService resources? It's an ideal resource for searching on the hotels available in the Hannover area. You can do so based on star [i.e., 'sterne'] ratings, location as well as price. The site also offers links to many other resources about Hannover, Germany. 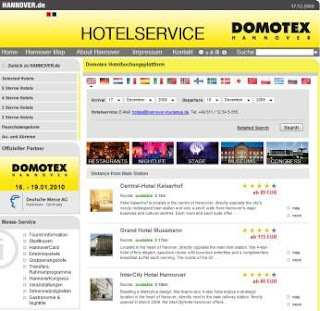 The HotelService site is accessible from the home page of the official Domotex Hannover site via an eye-catching red box [see below] or by going directly to the HotelService site. In case you are at a different stage of planning for your trip to Hannover, listed below are contacts from the DOMOTEX HotelService. They can answer your specific questions and help make your stay in Hannover that much more enjoyable and productive. NOTE: You may also want to refer to Jim's post about Domotex First Time Travel Tips. As always, if you have any questions, please don't hesitate to contact me. See you in Hannover!